The atmosphere surrounding Knik Lake was an empty canvas — flat light, soft snow, and a slate gray sky — as 49 runners and cyclists embarked on the 14th running of the Iditarod Trail Invitational, a 350-mile and 1,000-mile race across a wild expanse of Alaska. Temperatures were in the high 20s when the race started at 2 p.m. Sunday — which is considered warmer than ideal in winter racing. Like sled dogs, human athletes also have a harder time regulating their body temperatures when temperatures are near freezing. They often feel hot because they have to wear protective clothing to shield against cold breezes and moments when they’re stopped, but it’s too much for motion. As a result, they sweat more profusely, which wets clothing and chills later. 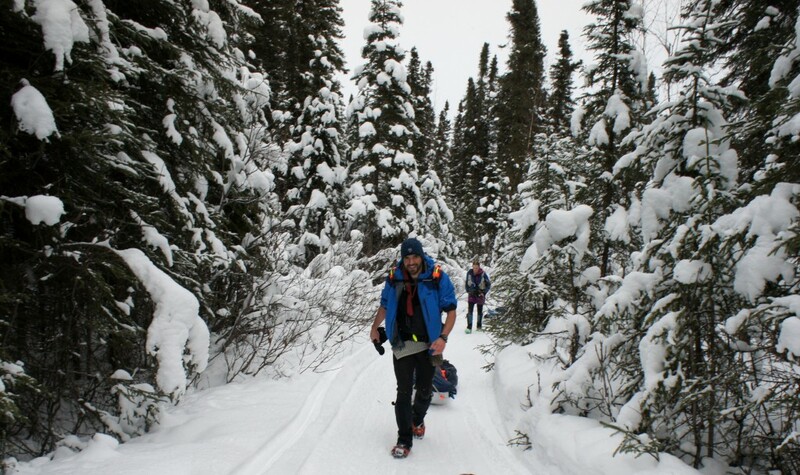 Melting temperatures also cause the surface of the trail to soften and churn up, an effect known as “mashed potatoes.” Soft and uneven trail conditions made for slow going early in the race as flurries of new snow drifted in the air. Still, the racers were in good spirits and excited for the challenge ahead. Beat chats with a relaxed Tim Hewitt at the Knik Bar shortly before the Sunday afternoon start. 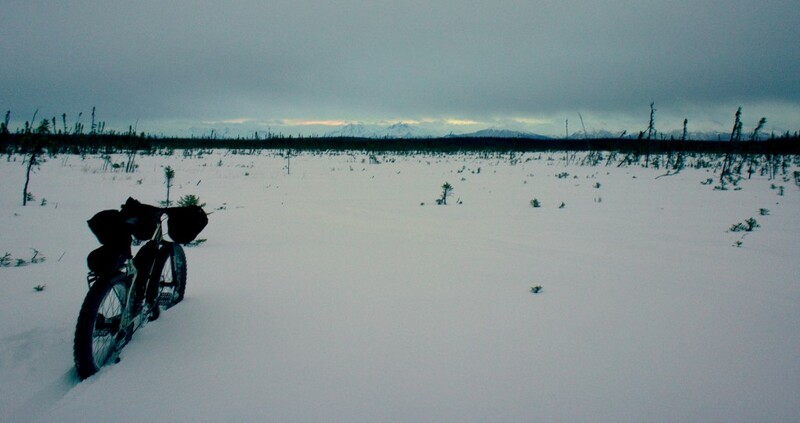 Tim has trekked to Nome six times and this year plans to do it completely unsupported, towing a 105-pound sled that contains 23 days worth of food and fuel. (Read a full profile of Tim here.) Tim’s wife, Loreen, who has raced to McGrath twice, is also attempting a (supported) walk to Nome this year. Beat walks with Joe Grant to the starting line. Joe is a talented runner from Colorado who is embarking on his rookie race to McGrath this year. Joe’s lightweight set-up is contained in a children’s toboggan that he sawed in half. 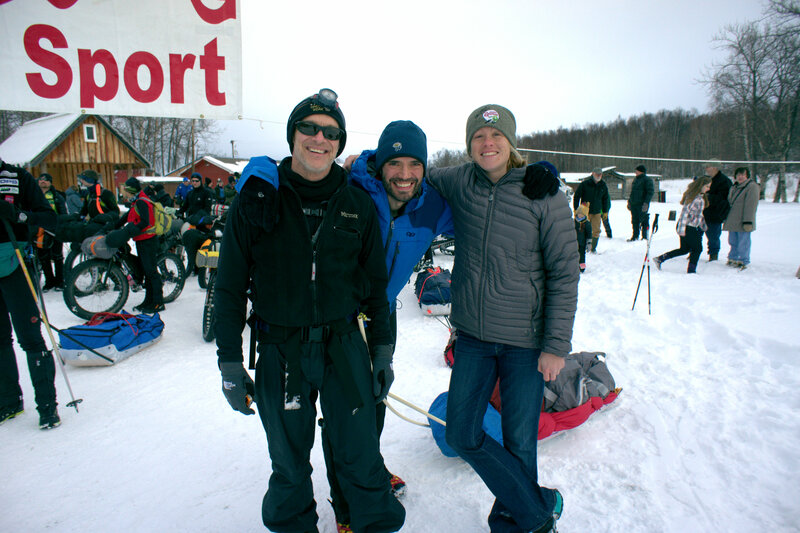 Tim, Beat, and I gather minutes before the start. Thirty bikers line up on the start. 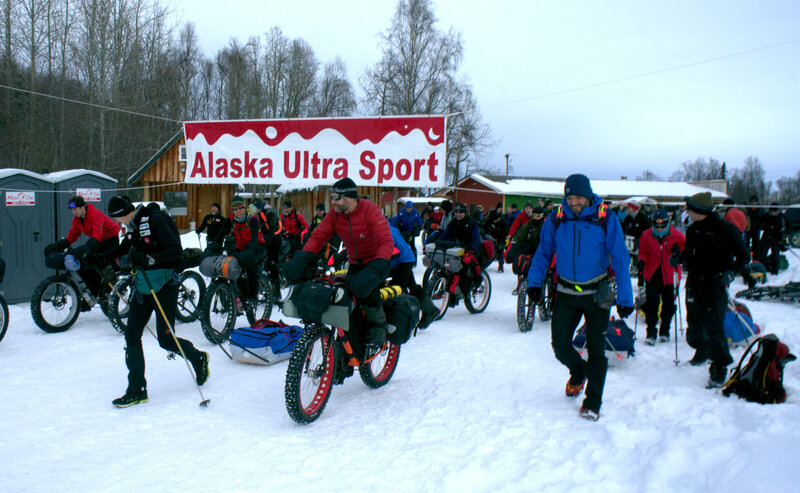 Noticeable this year compared to all other years I’ve attended an ITI race start was a uniformity to everybody’s kit — fat bikes with handlebar rolls, fitted bike bags, and the occasional rack (without panniers) seems to be standard issue in Alaska winter ultraracing. Gear has come a long way since the early days of the sport. At 2 p.m., somebody almost imperceptibly calls out “go,” and they’re off. Many faces were swept with both trepidation and relief that it was finally starting. 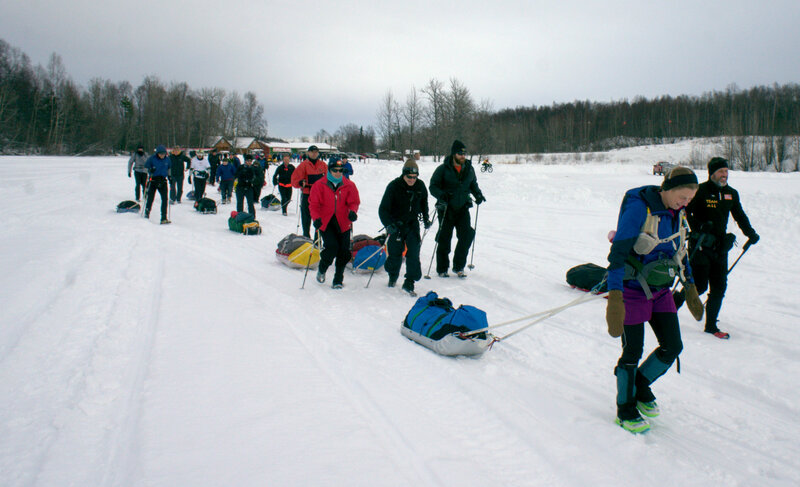 Another interesting aspect of the Iditarod Trail Invitational is that there is no set course. There is a start, finish, and a handful of checkpoints each racer must hit along the way. Navigation is a major part of the race, but racers are also allowed to choose their own route. 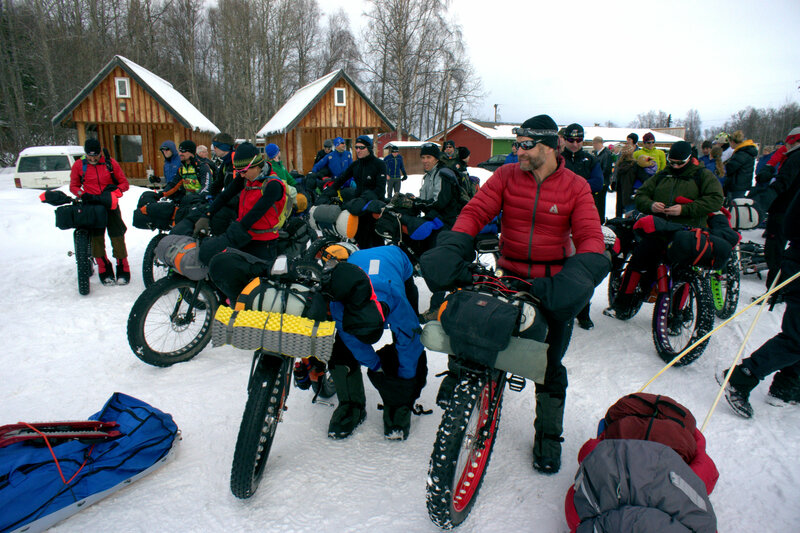 Over the years, bikers have discovered a series of trails from the start to Flathorn Lake that are longer than the standard Iditarod trail, but typically better for riding. 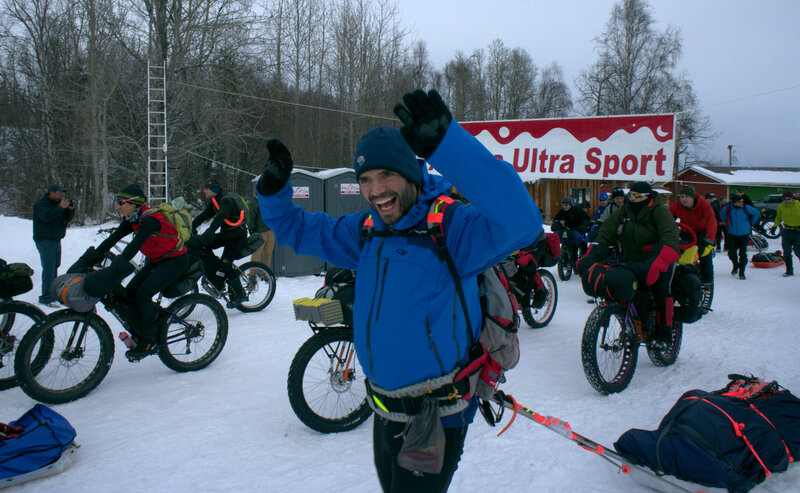 Two seconds after the race launched, every single biker turned left off of Knik Lake to ride the new course, while every single foot racer took the Iditarod Trail. 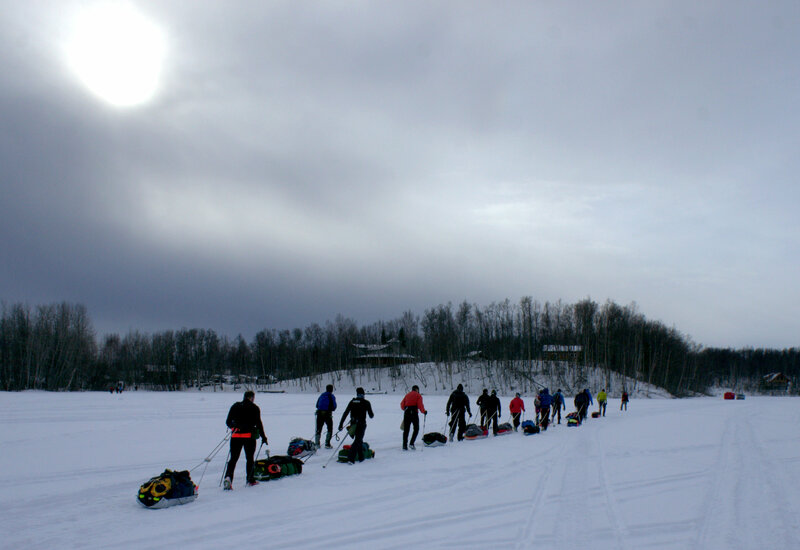 They crossed Knik Lake when the sun was already drifting low in the sky, ready for the long night ahead. Starting a little over an hour behind the racers, I had to pedal as hard as I could through the mashed potato snow to catch up to them, and it still took me more than ten miles to finally catch Beat’s group. By this point, he told me, “It’s all setting in.” He was beginning to grasp the scope of the journey in front of him. 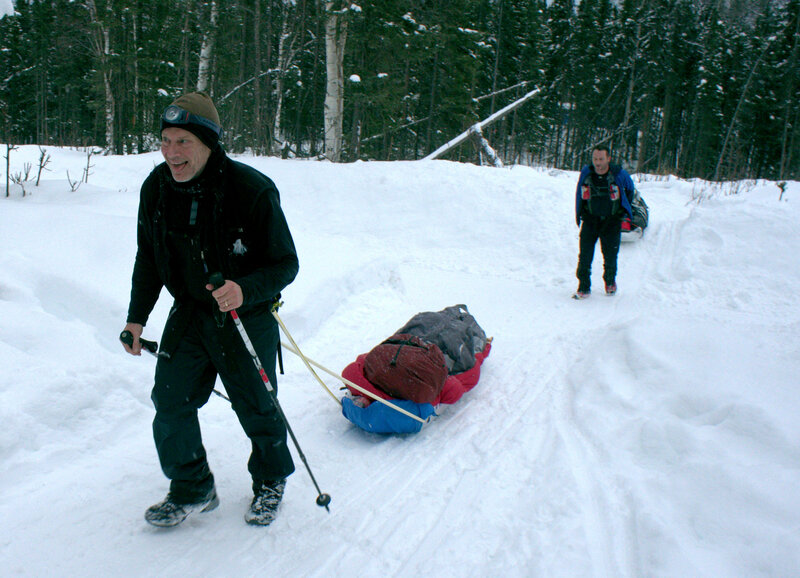 Tim Hewitt was still moving strong after eleven miles of dragging his hundred-pound sled. As he crossed Berma Road — the last road linked to the North American road system that racers will cross — I asked him what it was like. “The truth? It’s terrible,” he said, and then laughed. “But it will get better. It always does.” Spoken like a true master of the trail — or a crazy man. 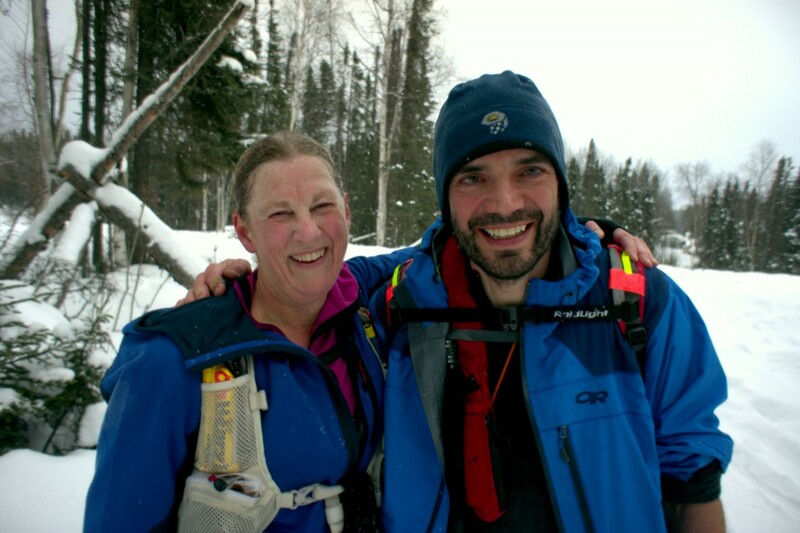 Beat was traveling with Anne Ver Hoef, an Anchorage resident who won the women’s race to McGrath last year and is also attempting to go to Nome this year. I passed them for the last time and bid Beat goodbye. It was an emotional moment for both of us — just realizing what this journey entails, the hardships he’ll have to manage, the dangers he’ll face, and the inevitable personal growth and change that will follow. I felt as though I was sending him off to the moon, which, in some ways, is an apt metaphor for the displacement of modern humans in the Alaska wilderness. I indulged in a few tears as I pedaled back toward Knik Lake with the skyline of the Talkeetna Mountains in the distance, and the ethereal blank canvas of the Susitna Valley swamps surrounding me. This is an incredible place that holds a deep affection in my heart. On a less personal note, the bike race was fiery hot on Sunday night, with a peloton of five cyclists arriving at the first checkpoint, 57 miles from the start, at 10:50 p.m. Although slower than years past, they’re still nearly a day ahead of the dismal pace of 2012, brought on by 36 inches of new snow that fell shortly after the race started. The lead bikers are veterans Jay Petervary and Jeff Oatley, and rookies Tim Bernston, John Lackey, and Kevin Breitenbach. Phil Hofstetter, Brian Hartman, and Jason Buffington were only ten to twenty minutes behind the lead pack. All checked in and out of Yentna Station and moved on up the Yentna River toward Skwentna, at mile 90. 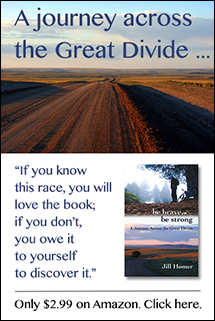 Beat called me from his satellite phone from Flathorn Lake, at about mile 28, just before midnight. He and Anne took a break to dry their wet clothing from the hard effort earlier in the day and say hello to Kirk and Peggy, the well-loved checkers from another Alaska race called the Susitna 100 and residents of a cabin on the lake. 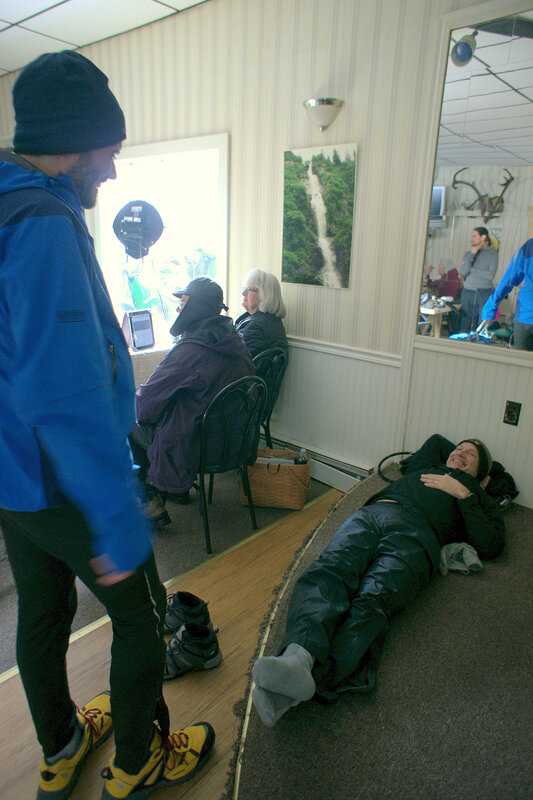 Beat said Anne planned to spend a few more hours sleeping at Flathorn while Beat would press on a little farther before stopping for his first rest. 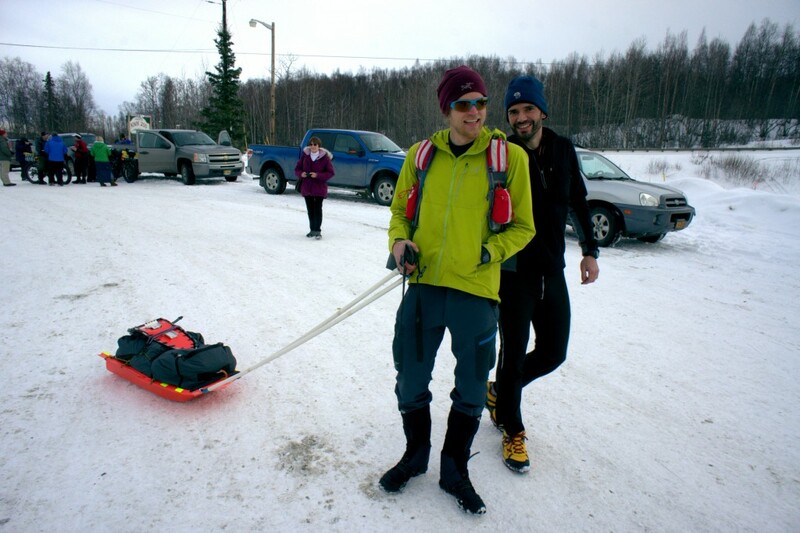 For the latest news on the Iditarod Trail Invitational, visit the race’s Web site. I also plan to post regular updates here. Great photos Jill. Thanks for sharing. Hugs to you, Jill. Can’t wait to read more and see more pictures.